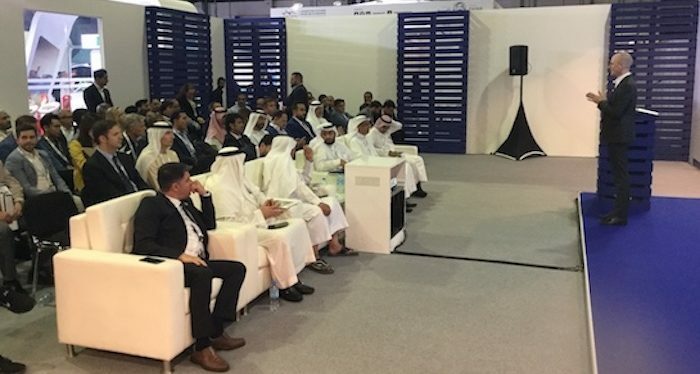 At yesterday’s opening day (December 4) of Gulf Traffic in Dubai, UAE, Siemens revealed details of a new research project it is working on – Flow AI – which is being developed to set timings of traffic signals at intersections using new artificial intelligence (AI) techniques. Unlike existing signal optimization systems, such as SCOOT, which rely on a limited number of engineer-designed timings, which are put into action depending on the traffic flows detected by embedded loops, Flow AI is able to create a virtually limitless number of new timings instantly, using cloud-based AI. The new trail project was presented by Siemens’ product owner for AI-driven ITS solutions David Borst (below) who compared the systems he is helping to develop to sophisticated spam filters in email – creating complex general rules which can then be ‘personalized’ for each specific section. This ‘personalized’ aspect differentiates Flow AI from existing signal phase and timing (SPAT) systems, such as SCOOT, which optimize timings across the entire network and must be pre-configured using a set number of possible programs. Flow AI is being built to treat each intersection individually and, it is hoped, will eventually be able to link them all together to create complete network control. 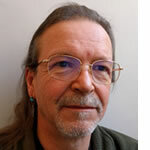 Borst’s research project is currently focused on five intersections in the German city of Hagen. One intersection was been chosen to run Flow AI. First its efficacy was proven using advanced simulation techniques. Now Borst is moving to the next stage of the project, which is deploying the system in the real world, to check that the simulation results can be replicated. He will then move on to attempting to get the system to be aware not just of the traffic approaching one intersection but of what is happening on nearby intersections and eventually on the entire network. “We want to create a system that is performing better by using artificial intelligence to detect and assign patterns,” said Borst. “And we want to use the characteristics of each and every intersection that is also self-learning, so it adapts constantly to create a system that is always up to date. Siemens is currently working with Transport fo London to create Future SCOOT. 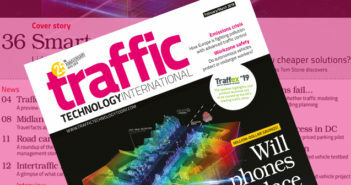 You can read a full report on this project in the October/November 2018 edition of Traffic Technology International magazine.